Chapter 15: The Miracle of the Geese! At last! In chapter 15, we finally find out about the intriguing event with the odd name. Somehow from its inauspicious origin on an amateur student film, it seems that the Miracle of the Geese has entered the cultural lexicon and been sort of re-imagined as a big musical film and from that, a Christian music concert. But what is it? What is at the heart of this great mystery? Just a little girl, among other children institutionalized at Woolcroft, who has a special gift. she put one pudgy hand over her heart and raised the other to heaven. But Vanessa didn’t watch. Instinctively, she had turned away, because everything inside told her that the next part wasn’t for her eyes but for her ears. And her voice has that same amazing quality to it that Vanessa had heard weeks ago at the church social hall, and then again, in the alley behind the restaurant. Not everyone can hear it, but Vanessa and Photini can; it’s as if the sound comes from everywhere. It is a miracle — something primitive and unexplainable. And if there were any doubt that what was caught on film was extraordinary, there’s the effect it had on a flock of passing snow geese. … on those last notes, her voice was lost entirely. The student apparently hadn’t had any idea what was going on until the last minute when the unmistakable sound of flapping wings could be made out. And then a snow goose as large as a soccer ball came to earth just in front of him, and the camera angled crazily as another landed and then another. By twos and threes the snow geese dropped to earth with a few last hop-steps as the camera skewed one way and another and tried to keep up. 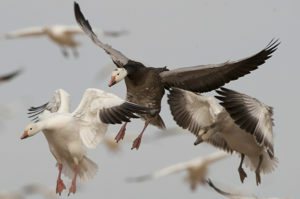 By the time the student had steadied his hand, dozens of geese had landed and shambled forward with their uneven gait. Their honking had subsided into gentler squawking, and without another word, Lily put her hand into the deep pockets of her apron and began to throw dried corn out to them. And that’s another thing … Lily! Vanessa makes a connection that readers have been getting little clues about all along — that the strange woman that Vanessa keeps bumping into is much more than what she seems. Vanessa just knows that the innocent child on the film is Mary that she met in the hall, who oddly referred to herself as Lily at one point. Suddenly, a window is thrown open that sheds light all the way back to her childhood and shows a picture that is both troubling and wonderful. Vanessa knows that she must be right — that God has brought Mary to her right now for a reason. Okay, so … where did all of this come from? There was actually an anecdote I had in mind, but it will seem a far cry from all this. When I started thinking about miracles and what it would look like if one were actually evident in front of everyone, I couldn’t help thinking about animals. On a primitive level, they are so much closer to God than we are. They are entirely natural, which still fills us with such awe sometimes, and maybe even envy. They are created beings that have never lost sight of being created — they answer the calls of instinct and from the smallest to the greatest, they go about their lives with a sense of direction and unquestioning obedience that we tragically lack. If miracles are a kind of outbreak of Holy Fire, animals might be the first to come forward — unafraid and artless — and warm themselves. It is so frustrating to be at a loss, when unbelievers claim that all they want is for us to produce ordinary evidence of our extraordinary claims. We can’t; our God Who is beyond all we can think, feel or say can’t be put into a test tube or on a microscope slide. The signs of Him are ubiquitous, but like manna from heaven, they disappear or grow rotten for those who want to grab hold of them for their own purposes. But perhaps if these skeptics saw animals react out of their naturalness and give witness to a miracle, it might make an impression? Maybe that’s a way to get past our calloused, 21st century defenses? That was my reasoning. 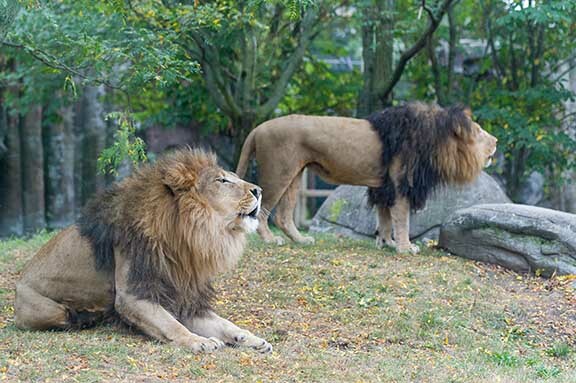 So my anecdote — so pale by comparison — was just this: One year around Christmastime, one of the big zoos near us advertised an evening event where we could stroll through the zoo after hours, have special treats, and at an appointed time, carol for the lions. I couldn’t resist — what a great thing to do. 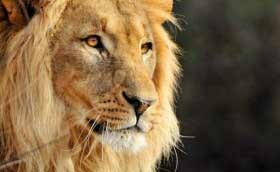 Lions are nocturnal, so maybe they would even be interested in our activities. But if they weren’t, there was something just spiritually satisfying about the whole idea. I was so disappointed. I think these days, I would have seen it coming, but at the time, I had some mad hope that we would be allowed to actually sing the “great glad tidings” to our fellow creatures, in some little way acting out the part of the hosts of angels. Nope. But here’s the good part. We got through with our feeble efforts and turned to shuffle away from the lions in their massive enclosure. They had only evinced the mildest curiosity in our vocalizing, but when we finished up, they decided to have the last word. 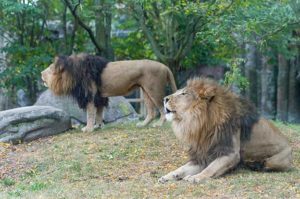 The lions began that low gruffling cough you hear them do sometimes, but as one tried to outdo the other, the volume rose to a proper roar with that rippling, ripping effect that is so startling. I really don’t remember how long they roared back and forth — it might have been 15 seconds or a half an hour for all I cared. “The lions are singing!” my friend shouted to me, and it made my heart just about burst for happiness. They were. We were constrained from being the Christmas angels, but the lions weren’t subject to such nonsense. They sang a song from earth to heaven and heaven to earth. For some time when I was trying to arrange all the bits and pieces of Vanessa the Wonder-worker, I tried to fit in lions. 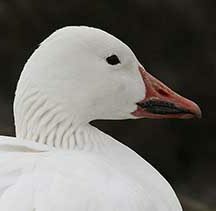 But it was just becoming too bizarre, and in the end, I had to switch them out for a wild animal a little more well-known in the Midwest — the lovely, lovely snow geese, which I always loved seeing when I lived there. So we have the Miracle of the Geese, the wonder at the center of what follows. I hope it helps explain some of what happens as we all move forward. The girls still have weeks to go until Ascension Day. So onward we go. I have a similar strong opinion about the difference between Christmas carols and “winter songs.” I appreciate a good winter song about snow and cheer and such on a blustery day, but it’s not a Christmas carol!